Cut the red pepper in half, cut off the stem and scoop out the seeds. Roast (cut side down) at 350 to 375 for 10 minutes. Wash and pat dry the kale leaves and parsley. Place sun-dried tomatoes (rinsed and drained) in food processor. Add greens, roasted red pepper and tomatoes. Pulse until coarsely combined, adding in garlic, pine nuts, lemon juice and nutritional yeast. Drizzle olive oil in as you continue to pulse until you reach the consistency of your liking. The nuts in this recipe are easy to replace: you can switch out the pine nuts for walnuts, almonds or any nuts - and if you have a nut allergy, you can easily switch to nutrient-packed sunflower, sesame or pumpkin seeds and the pesto will still have a great taste and texture. 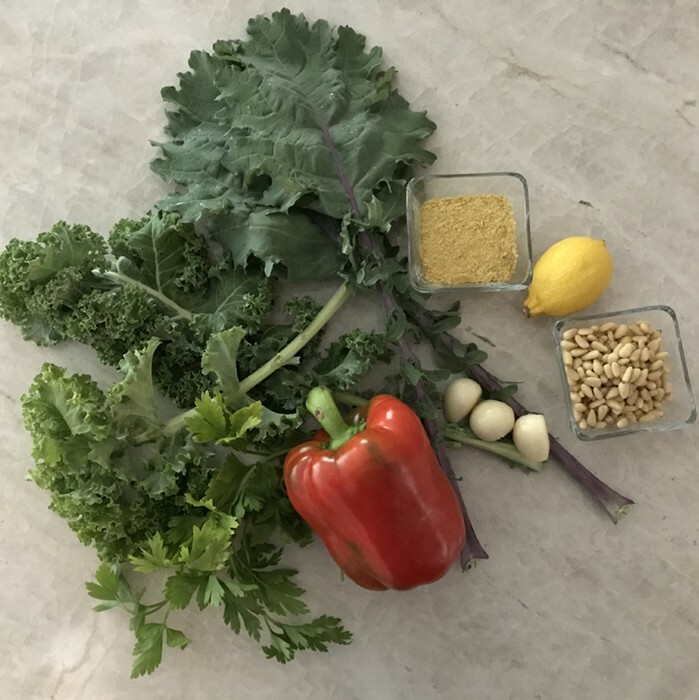 You can add more nutritional yeast for a "cheesier" pesto, or replace nutritional yeast with the classic parmesan (if you can tolerate dairy) or another parmesan substitute (there are many out there in health food stores). Use this pesto as a dip, on pasta, on a pizza, as a garnish on the protein of your choice, and a great garnish on a soup.